THE HIGH PRIEST – PHARISEES – ROMAN DENARIUS – PT 4 – RENDER THEREFORE UNTO CAESAR (MATTHEW 22:22) | My Blog Title is "THE UNVEIL PERSPECTIVE"
It was natural that after a while, the elders of the Church (synagogue) seek great ties with the emperors of Rome. Actually, in the end, such rendering unto Caesar was not profitable. Roman Emperors manoeuvred the elders (Sadducees and Pharisees), and it created a havoc on the society. But then, the other side of the coin referring to the Pontifex Maximus (High priest) of sovereign Rome, was about to manifest. Tertullian, though not look upon with great example, especially by many church fathers, sees the Pontifex Maximus, as a pagan imperial office, working as a religious instrument in the heart of Rome. During the time of the early church fathers, all emperors who wore the Pontifex Maximus acquired the authority as Head of Religion under imperial law. The Messiah’s prophetic indication did not point only to the world that exists then as the world of Rome, but a rendering to the ruler (“Mammon”) of that world (Rome) and the ruler (The Divine) of the world (New Jerusalem or Zion) to come . How prophetic was the Messiah, as he uses a coin that has both images (“Roman goddess of peace” and Caesar’s images) and the superscription (the Pontifex Maximus) symbolically. 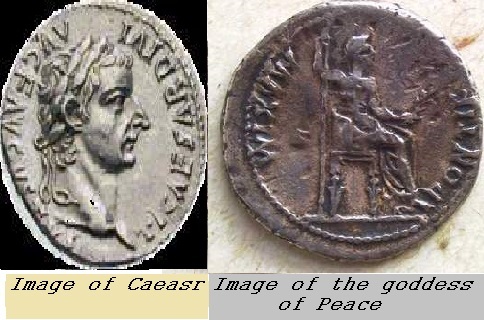 This gives indication that the “Roman goddess of peace” (Pax Romania) and Caesar are one, as both served as that image of the roman gods, where Caesar who wore the Pontifex Maximus serves as that high priest. Christ, making such subscription, symbolically meant that the children of Roman’s pagan cult note Caesar as their high priest, but the Most High children should note the Elohim as their High Priest. More explicitly, he says, “man cannot serve god and mammon” at the same time. The image of the “goddess of peace,” was to the early (second century) church fathers as the sign of the antichrist. In fact, the “Pontifex Maximus” served as that title that proved its sovereignty to the people of Rome. QUESTION – Why did the Messiah gives reference to the coin, and with it, He states the rendering of the Jews (Elders)? ANSWER – Christ knew that the Church would sweep up in unawares, as one would sit in the seat of Caesar, and upgrade the throne of the enemy (man of perdition) of this world. He knew that the elders of the Church (Synagogue) would forswear, rendering to the antichrist their allegiance, which it was their main purpose from the beginning. In fact, Christ’s statements on the antichrist show that He knew that scoffers and perverts would find themselves into the Church. Moreover, not only that, but the antichrist (the man of perdition) would mould himself like unto the Messiah, affixing his images of consul within the Church, to deceive many. As for the throne, we have known that Caesar wore the title” Pontifex Maximus”, a title that must soon be on its way to its rightful owners. Prophecies are inevitable, and by it, the power of the Most High declares triumph. “Pontifex Maximus,” known as the sign (title) of the Antichrist, was a known superiority advertise as a Roman supreme. It act as a force against the King of the Jews, the Son of the Elohim. Moreover, the seat (throne) of Caesar was seemingly not the only active force against the Messiah and all that called of Yahweh (God). The Jews and elders of the synagogue also sour the taste of the grapes. ” for that day shall not come, except there be a falling away first, and the man of stripe revealed, the son of perdition;” (2 Thessalonians 2:3 KJV). Tertullian (160-220 AD) exercises’ his thought (2nd Thessalonians) on the” man of perdition” and the” falling away”. Tertullian referred to the “falling away,” as the falling of Rome, while he addresses the “son of perdition” (the Antichrist) with the “man of sin,” who is the “Beast,” spoken of in “The Book of Revelation”. He sees the “man of perdition” as the great persecutor of the Church, but more interestingly, he attained the understanding that he would be a character out of the Church. As for the text (2nd Thessalonians 2:4), Tertullian must have recognises the disclosure of the man of perdition performing as a religious entity, in that “he sits as god in the temple of God”. This verse indicates that the “temple of God” simply meant the true attained Church set out by the early apostle, which was overran by others. Most church fathers admonished that the temple of God would be encamped and reconstructed as the base (Probably a church) of Rome. “Yea, he magnified himself even to the prince of the host, and by him the daily sacrifice was taken away, and the place of his sanctuary was cast down” (Daniel 8:11). This Antichrist, as the books indicated, was as this “little horn” mentioned in Daniel 8, who excelled to the “host of heaven” and disregarded the ministering spirits of the Messiah. Host symbolized the great congregation (saints) of the Most High, and the stars represent they who stand above them as elders. Continuing in the text, we see that the “daily sacrifice was taken away”, and “the place of the sanctuary was cast down”. For this Antichrist to set up as His Excellency (his regime), he has to destroy the sanctuary and “cast the truth to the ground”. In so doing, he then sits as god in the sanctuary of the Most High. Pingback: THE HIGH PRIEST – PHARISEES – ROMAN DENARIUS – PT 4 – RENDER THEREFORE UNTO CAESAR (MATTHEW 22:22) | My Blog Title is "THE UNVEIL PERSPECTIVE"